I really love this series! And sure I had my doubts, I had fallen in love with the books and now they ended and we got a spin off. I was unsure, but I did not need to be. It was just as good. Vicky was unsure, had anxieties, was not comfortable around men and just wanted to build a new life. Oh that scum of an ex husband, I wanted him to be eaten!! She was a kind person who deserved better. And now she had renovated a dump settled on her in the divorce and wanted some guests at her resort. But oh uh, instead she has a murder on her hand. Fingers pointing to her and luckily, her being kind and all, she has help. The bookseller in town is a good friend. The woman at the lodging house is also a nice friend (and what on earth was up with some things there?). And most of all The Others. Aggie from the crow guard was a sweetie. Who wouldn't like the crows and their obsession with shinies. And there are Others too. I do love the Others, I want them to eat all bad people. Ugh, humans! We really are monkeys who should have stayed in the trees. They are so stupid. Like omg, The Others, The Others! They killed and destroyed cities in the previous book. One think humans should have learned a lesson but noooo. They should all be eaten. Oh what a ride! I did not want to stop listening! It is good when I take every chance I can to listen, even stay up late to listen. A great stand alone in this amazing world. More now please. She was great too. I liked all her voices and accents. Her spooky voice was indeed creepy. Human laws do not apply in the territory controlled by the Others--vampires, shapeshifters, and paranormal beings even more deadly. And this is a fact that humans should never, ever forget . . .
After her divorce, Vicki DeVine took over a rustic resort near Lake Silence--in a human town that is not human controlled. Towns like Vicki's have no distance from the Others, the dominant predators that rule most of the land and all of the water throughout the world. And when a place has no boundaries, you never really know what's out there watching you. Vicki was hoping to find a new career and a new life. But when her lodger, Aggie Crowe--one of the shapeshifting Others--discovers a dead body, Vicki finds trouble instead. The detectives want to pin the man's death on her, despite the evidence that nothing human could have killed the victim. As Vicki and her friends search for answers, things get dangerous--and it'll take everything they have to stay alive. I sort of lost interest in The Others series by the time it ended. I still love The Others! and wanted to see Meg & Simon work it out but all the human complaining annoys me. I'm not sure if I'll give this a try or not. I might get it from the library to try first. Thanks Blodeuedd she is definitely an author on my wish list. I will be adding this to my wish list. I have so much fun with these books! My only issue with this one was that it's so similar to the original series. I hope it differentiates itself with the next one. Yay! Glad the spin-off was just as good as the older series and the audio made it even better. Okay you may have convinced me! I so didn't want to listen or read this one because I loved the series and didn't want a new aspect. But... maybe! Like you, I was worried how things would play out in a spinoff. I was a bit taken aback that the humans were not more worried about ticking off the Others after they culled so many humans both in the "US" and in "Europe." But, humans are stupid. I loved the Sproingers! I ended up really liking this one, even though at first it felt like a repeat of the original series. I want to stay with Vicky, but I guess we move on to another location in the next book. One of my favorite series. I am excited to see where she takes us next! I liked this one a lot. I bet that the audiobook would be even better. I can't wait to read more! 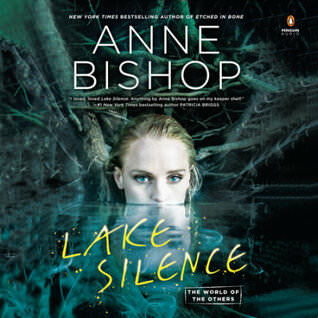 Anne Bishop is great at showing us that humans are often more horrific than the monsters. I wanted her husband to be eaten too. I saw that the next book is in a different location. I'm sad to be leaving Vicki and her friends so quickly. HUmans are the true monsters. Ugh her husband, eat him already!! !